Dellett Auction Service is a family owned and operated business. We are based out of La Crosse, which is in the heart of Rush County, Kansas. but the love of auctions has been around much longer. 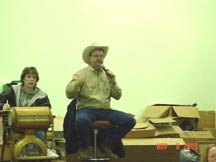 and was helping with auctions long before that. and it was Rich Petrik that first let him call during a real auction. ... the dream came true. We specialize in household, antiques, farm, estate and liquidation sales. but still small enough to know what matters to our sellers. Getting the top dollar for our seller is our number one goal. and let Jason tell you what Dellett Auction Service can do for you.